The Flash is winding down its first season, and there’s a lot in store for fans, from a prison outbreak at S.T.A.R. Labs to Barry and his allies attempting to stop Harrison Wells, a.k.a. the Reverse-Flash. Obviously series lead Barry Allen will be at the forefront of what’s coming, but each character will have their own moments to shine. In the case of S.T.A.R. Labs inventor Cisco Ramon, one of the showrunners is teasing that he’ll be moving closer to his superhero career as Vibe. Executive producer Greg Berlanti sent out a tweet earlier today of what fans can expect to see this season’s final episodes. Included among hashtags like #Grodd and #Rogues was Cisco’s superhero identity. The last run of #TheFlash eps continues tonight. Here are your clues to the remaining eps #Vibe, #Grodd, #Rogues, #ReverseFlash. #Watchlive! Vibe debuted in the comics in 1984 and was a member of the Justice League. 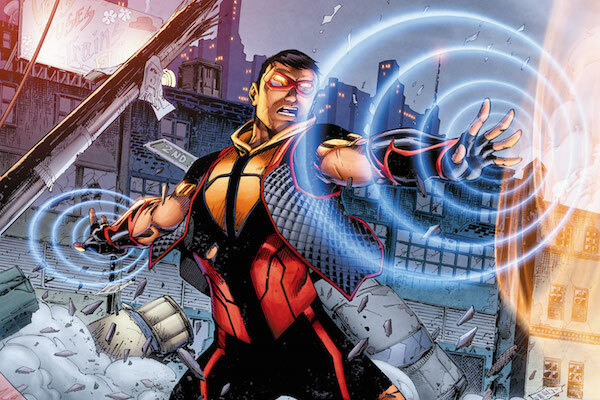 He was reintroduced during the New 52 as a member of the government-sponsored Justice League of America, along with his abilities being expanded beyond just being able to create seismic vibrations. With only three episodes left following tonight’s episode “The Trap,” it looks like Cisco’s role will become more important, but the question is how The Flash will give us Vibe. It’s possible that Cisco’s path to becoming Vibe has already been teased on the superhero show. In the episode “Out of Time,” Cisco was killed by Wells after he discovered that his mentor was the Reverse-Flash, but thanks to Barry traveling back in time during his attempt to stop Mark Mardon, that timeline was rewritten and Cisco is still alive. However, recent episodes have had Cisco experiencing brief visions of his death in the old timeline. In the New 52, Vibe’s vibrational powers include detecting beings from other worlds and even going into alternate worlds and dimensions. Perhaps on The Flash, his powers will allow him to sense events from different or wiped out timelines. That would explain why he is the only one experiencing these visions on the show. Giving Cisco superpowers would be easy enough. Like the rest of the Central City metahumans, he gained his abilities from the particle accelerator explosion, but it took longer for them to surface. The big question is whether the Vibe we’ll eventually see will be from the show’s main timeline or a different timeline. Barry has been determined to go back in time to prevent his mother’s murder, but when he did that in the comics, that resulted in the Flashpoint timeline, which featured altered versions DC characters and a world that was on the brink of collapse. Perhaps if he is successful in saving his mother, Barry will create a Flashpoint-like timeline, with one of its differences being that Cisco is a superhero. If that’s the case, perhaps we may even see Caitlin Snow in her Killer Frost identity. You can catch the final Season 1 episodes of The Flash on Tuesdays at 8/7c on The CW.